Rahm Emanuel is criticized in the New York Daily News for comments he made about New York's transit system. CHICAGO — An op-ed penned by Mayor Rahm Emanuel touting the CTA and urging an increase in the federal gas tax to fund mass transit has backfired a bit in the Big Apple. 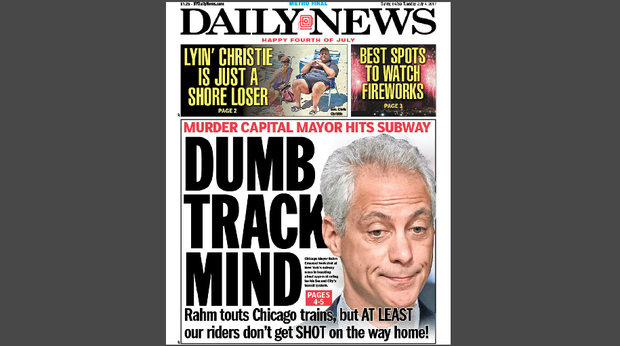 The New York Daily News' front page headline Tuesday: "DUMB TRACK MIND" illustrated with an unflattering photo of Emanuel. In Emanuel's op-ed, which appeared in Monday's New York Times, the mayor noted recent troubles affecting New York's mass transit system including a derailment and "an epidemic of delays." He cited similar challenges facing Washington's rail system in arguing that America's public transportation needs more federal cash. He went on to boast that Chicago's system wins high approval ratings from its riders — 85 percent, he said — and credited good decisions on the part of the CTA, which, he noted, he controls. Responded the Daily News: "Congratulations to Chicago for having a transit system that’s so popular with its passengers. Now try getting them home without anyone getting shot." The story complained that "Emanuel wasn’t satisfied with just patting himself on the back. He had to tie New York and Washington to the tracks and rumble his railroad over his rival cities." The official, the paper said, "appears to have been making a not-so-veiled reference to Chicago’s out-of-control homicide rate, a cycle of violence that earned the city the nickname 'Chiraq.' "
Meanwhile, the New York Post also weighed in with an editorial. Referring to Emanuel's former job as chief of staff for then-President Barack Obama, the Post observed, "exile from national politics plainly hasn’t cost Rahm Emmanuel an ounce of chutzpah." Noting NYC's larger system, the Post said getting advice from Emanuel was "a bit like the Charleston River Dogs telling the Yankees how to play."